Black Panther is set in Wakanda, a fictional African country set somewhere near actual Uganda. The name ‘Black Panther’ is also a title given to the warrior that serves as the champion of the nation, a title held by the film’s protagonist T’Challa (Chadwick Boseman), son of the recently assassinated King of Wakanda T’Chaka and heir to the throne. Wakanda is thought to be an impoverished Third World nation by the outside world but is secretly the most technologically advanced nation on earth, made possible by its virtual monopoly over a mysterious metal known as vibranium which powers its technologies. The tension between T’Challa as protector of Wakanda’s isolationist history and the larger Black world becomes part of the central conflict of the movie. Importantly, for both the movie and the soundtrack, Black people are the major players on both sides of the conflict; sometimes the sides clearly arrange themselves into moral right and wrong, while at other times the conflict seems more about perspective. Many think-pieces responding to Black Panther in the US have tried to map the ideological struggle in the film onto historical struggles in the US, such as ones between violent and non-violent resistance and Black nationalism vs. integrationist approaches to Black liberation. Besides the fact that Wakanda is a warrior-led nation, troubling the non-violence vs. violence framing of the movie’s conflict, the fact that Wakanda controls its national resources is a crucial and decisive context for the ideological conflict in Black Panther. It means that the outcome of the struggle between T’Challa and Killmonger will decide the political trajectory of an entire nation, not of an activist movement – that is, it will move armies, policies, and resources on a massive scale. 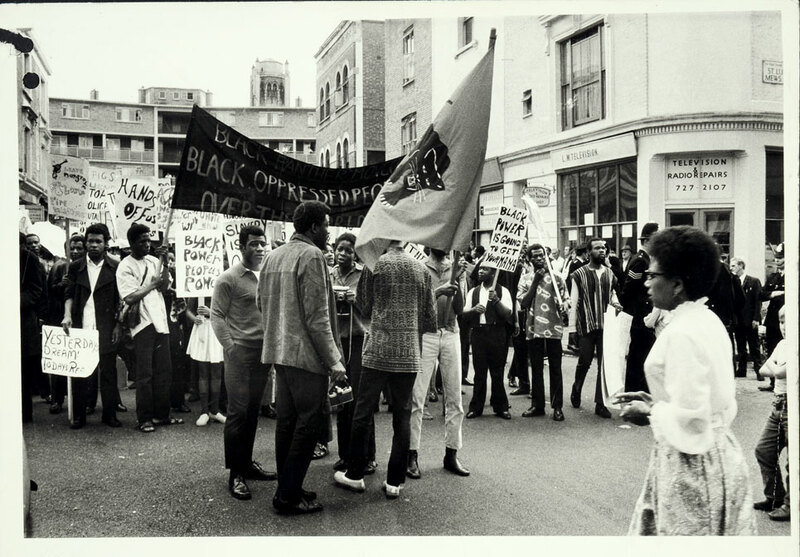 While the stakes in the film are not those of the Black movement in the United States, they do reflect the history of struggle between ideologies and political actors in many anti-colonial movements on the African continent and elsewhere in the diaspora. For the continent, there is nothing hypothetical about the dangers posed by putting the wrong person in power, as the continent has had no shortage of real world Killmongers, some who participated in the anti-colonial struggle. The ideological conflict of the movie is less Malcolm X vs. Martin Luther King and more Nkrumah vs. Lumumba. The struggle in Black Panther is, first, over whether to have a Pan-Africanist orientation at all and second, over what the demands of a Pan-Africanist orientation would be. Less explored by many of the think-pieces written in response to Black Panther is the Pan-Africanist stance embodied by Nakia, T’Challa’s love-interest. This is a shame: Nakia’s emphasis on genuine solidarity illustrate a politics which has served well the liberation efforts of Africans. Overlooking Nakia’s vision is also odd: after all, the film introduces us to our hero, T’Challa, through Nakia’s covert mission to infiltrate a group seemingly styled after Boko Haram and save their women captives. This mission fills out Nakia’s larger practical pan-Africanist vision, which is in fact the alternative to Killmonger’s global Wakandan empire of blood that T’Challa struggles to accept, though the movie’s final scenes show him ultimately taking timid steps towards this vision ed. It is Nakia and the Queen Mother who bridge the divide between the Jabari, Wakandan ethnic outcasts, and the rest of Wakanda. They discuss who to empower and why, with purpose and responsibility rather than rage and pride, which generally inform the decisions of the film’s more prominent male characters. Finally, Nakia is openly acknowledged as the savior of the country by T’Challa in one of the film’s important final moments. A review of the recent history of anti-colonial struggle shows clear parallels with the conflict in Black Panther. In 1945, World War II ended in defeat for the Axis powers: Germany, Italy, and Japan. This cataclysmic global war shifted the global balance of power away from ravaged Europe. The new political reality presented opportunities. Africans felt the colonial grip loosen and got to work prying it off completely: most African nations gained formal independence within thirty years of the end of the second World War (and many within fifteen years). But it also presented opportunities for the new dominant global powers: the United States and the Soviet Union. International relations began to organize themselves around the diplomatic, political, and military arms races set-off by the Cold War. As formerly colonized nations achieved formal independence, some national governments resisted this bi-polar trend. Through a series of meetings, declarations, and conferences in Indonesia, Egypt and Zambia, a Non-Aligned Movement was formed of nations that wanted to remain neutral in the Cold War. This movement is the reason for the term ‘Third World’ – while today it is just a shorthand for ‘poor’ (or, euphemistically, ‘developing’), its original meaning was a political one – it differentiated non-aligned nations from nations aligned with the US (the First World or the Western bloc) and with the USSR (the Second World or the Eastern bloc). The Third World would eventually include much of Central and South America, as well as the majority of the African continent and much of Asia (with notable exceptions like China and North Korea). Together, these nations accounted for a majority of the world’s population, and the clear majority of the world’s poor people. Many figures often remembered for their radically liberatory politics, like Kwame Nkrumah and Patrice Lumumba, embraced the strategy and ethos of the non-aligned movement. The principles agreed upon in the Non-Aligned Movement were about maintaining distance from immensely destructive global conflict: mutual non-interference and non-aggression, and non-participation in formal military alliances like NATO. While not quite as isolationist as Wakanda, the same basic ethos applied. The principle of non-alignment was in tension with a more interventionist, cross-national political ethos that had developed in anti-colonial struggle. African nations had no problem ‘meddling’ in each others’ affairs to remove colonial forces from the continent. Freedom fighters of the Zimbabwean African Nationalist Union (ZANU) found refuge in Mozambique; Pan-Africanist and Pan-Arabist President Gamal Abdel Nasser of Egypt was a strong supporter of Algeria’s National Liberation Front, for example. While Algeria, after its independence in 1962, would serve as a training ground for freedom fighters from the continent’s other struggles. Finally, the anti-apartheid struggle in South Africa received aid of various kinds, from training to refuge, from outside its borders: whether from allies on the continent in Angola and Mozambique to allies in the Second World, including Cuba and notably the Federation of Cuban Women (FMC). So, at least some countries, in some situations, aligned themselves with the continental struggle against colonialism. Debate about the costs and risks acceptable for these countries were a constant source of contention between political actors in this period, from states-people to activists, from governments to unions and political parties. The struggle between Killmonger and T’Challa isn’t an exact parallel, but there are dramatic similarities. Wakanda wanted to remain isolationist to preserve its technological advantage over bellicose countries, not as a strategy to manage a technological disadvantage. It also took isolationism to an extreme that the Non-Aligned Movement did not – aid, trade and diplomatic alliances were still options for Non-Aligned nations. But the basic contours of the conflict between Non-Aligned rule and interventionism mirrors the one between T’Challa and Nakia: between security for one’s people and responsibility to justice on a world scale. It is precisely these questions which concerns Nakia as she urges T’Challa to participate more in Black global affairs. At the beginning of the film, Nakia is participating in small-scale mutual aid projects: hunting ivory poachers and human traffickers, yet she remains dissatisfied with the limited impact of her efforts. One woman can only do so much. By the end of the movie, T’Challa is moved enough by Nakia’s influence – and elements of Killmonger’s criticism of Wakanda’s isolation – to invest in large-scale improvement projects in Oakland, California, which signals his readiness to engage with the world. Wakandan engagement with the world moves from small-scale, individual covert operations to large-scale, state-backed ‘outreach.’ However, in the film’s conclusion the initiator of these ventures shifts from Nakia to T’Challa. At the end of the movie, T’Challa seemingly coopts and dilutes Nakia’s more radical vision of what mutual assistance could be, in revealing his plan for Wakandan outreach centres whose functioning and organization remain unclear. Moreover, mere outreach, however large the scale, is not enough. In order to effectively relate to Black populations, it had previously hidden itself from, Wakanda will need to engage in the multi-scale efforts to liberate Black peoples. In the real world, aspects of Pan-Africanist internationalism created or invigorated by anti-colonial struggle remain. At the level of national and international government, there are already multinational institutions set-up for the purpose of facilitating cooperation between African-descended peoples across borders: from regional institutions like ECOWAS, CARICOM, and SADC to larger bodies like the African Union (formerly OAU). Some of these are even pursuing politically promising initiatives: the creation of an all-African Union passport and the renewed call for global reparations (to African descended and indigenous peoples) justice spearheaded by CARICOM and a UN Working Group. But, like T’Challa’s vision, these efforts are not yet enough, and the stakes are quickening. As the effects of climate change worsen, it will be the Third World that bears the brunt of the costs and burdens, from literal destruction due to rising sea levels to a continued disproportionate burden to take in the world’s climate refugees. Any serious Pan-Africanism will need to do more than get actors that look like us in films (even ones as great as Black Panther) – there will need to be a serious, structural, and permanent alteration to the distribution of resources and political power on a world scale. Outside of the Marvel universe, pan-Africanist struggle will need to operate on all scales of politics. Nakia-style interventions into hot zones of conflict will continue to be necessary. But we will also need to contest structural aspects of the global political order head on: the current function of multinational institutions like the World Bank, IMF, development banks, to finance desperately needed infrastructure projects and manage the dangerous and exploitative effects of international finance. We will need to advocate for reparations at a global level, and to organize support for land redistribution programs broadly, including the one proposed in South Africa to redistribute land currently owned by white South Africans to poor Black South Africans. We must expect and act to anticipate and counter the effects of violent First World opposition to both, in the event that there’s an attempt at follow through. At lower institutional levels, concerted groups of individuals can create durable links of transfer of material and epistemic resources between institutions like universities, laboratories, and other institutions in the First and Third World. This would ensure that at least some of the vast research, political infrastructure, and other resources made possible in the final analysis by wealth accumulated in the first world returns to the hands and control of indigenous and African descended peoples – as co-owners, not as objects of study. T’Challa wasn’t entirely off the mark with the job he entrusted to Princess Shuri. Finally, either the African Union, or another suitable multinational body, should expand to include the African diaspora outside of the continent itself, including nations of primarily African-descended peoples in the Caribbean and South America, or there should again be a global alliance of indigenous and other colonized peoples on the scale of the one represented by the Non-Aligned Movement. Activists and organizers should likewise cultivate personal relationships to groups in the Third World – not token ties for the sake of providing PR cover for their ‘hot takes’, but substantive alliances laying the groundwork for revolutionary intercommunalist struggle. Olúfẹ́mi O. Táíwò is a PhD candidate at UCLA. His research focuses on ethical and political theory, anti-colonial thought, and the Black radical tradition. (Chelsey) LaKeyma Pennyamon is an undergraduate philosophy major at Morgan State University. Her interests include political aesthetics, Black radical traditions, and poetry. Beautiful ! Thank you so much! “Additionally, the scene is completely superfluous. It has literally nothing to do with any other storyline in the movie. the scene serves to show that nakia, as an embedded spy, had a passion for working with black people across the diaspora outside of wakanda. this is important because nakia”s character was the counterpoint of t”challa”s character. t”challa was the head of an isolationist african nation, and nakia his former love and intellectual partner was not willing to be politically isolationist. nakia”s character also serves to show the differences in liberation theory when looking at killmonger”s appetite for vengeance, destruction, and the ultimate empowerment of black americans. perhaps the use of the kidnappers in the film was islamophobic. i”ll have to discuss this more with folks. however, you need to note that the scene itself was not superfluous. it was integral to understanding the political struggle of the three characters i mentioned.